To make any profits with any forex trading signal, the first thing you have to do is at least to execute signals properly and to do it on time. It's hardly possible you are ready to devote to the trading process your full working day. In most cases, the clients use the forex trading as an additional source of income and do not have enough time to execute signals by themselves. Moreover, it may take excessive time to receive a signal, to open a trading platform and to enter all the required options. Signalator offers 100% automated trading signals. What exactly it means? We will take care of the full trading process. You will have to do virtually nothing to make profits with our signals. The only thing you have to do only once is to install the autotrader directly on your trading platform and leave it running. However, if you do not want to do it yourself or you do not have any suitable computer for it, we will install everything on our VPS server and we will be looking after your account. Please note: all trading decisions are made solely by human professional traders and the automation is used for execution purposes only. We do not use any trading robots or automated trading systems. 100% Automated trading for you. Your account is growing while you are sleeping, working or resting. Instant, reliable automated execution of all alerts: Open signals, SL / TP levels updates, Close signals. Professional traders alerts executed for you round the clock wherever you are whatever you do. Manage lot sizes from personal page. Use fixed size or % of deposit. Signalator autotrader is an EA (expert advisor) designed by Signalator IT team and is suitable for any FX broker metatrader account (either MT4 or MT5) and any brokers with non-metatrader trading platforms supporting API bridges and copy trades software (e.g. MT4 bridge to IB Trader Workstation TWS). The only thing the autotrader is supposed to do is to collect trade details from Signalator website and to pass it to your trading platform for execution. If you do not have any metatrader account, contact your broker to find out whether it can offer this type of an account for you. Metatrader is widely used trading platform and most brokers offer it. If you are sure you don't have the metatrader account but you still want to have all trades executed for you, we can offer you two options: manual trades execution by company traders for an additional fee or the managed account services. How can I use automated trading? There are two ways to install the autotrader: a) you perform an installation by yourself within approximately 3-5 minutes or b)we may install your trading platform with autotraders on our server, your PC or your VPS / server via TeamViewer or any similar software. If you would like to install it on your own, please refer to the Installation Instructions. The detailed installation instruction is available. If you would like us to install both the trading platform and the autotraders on Signalator server, please contact us and provide the following details: a) the broker name (e.g. FX Broker 1) b) the link for a platform installation c) FX Broker trading account login d) FX Broker trading account password e) trading server name (e.g. Live-Euro-001). Please note: these details are used for the installation purposes only and are deleted once an installation is complete. Your funds will remain secure as the money can be withdrawn to the account holder's account only. Q. Is it possible to have all trades automated? A. Signalator offers 100% automation for any metatrader account. It means you do not have to do anything at all. Everything will be made automatic. Q. Is it safe to use the Signalator autotrader? A. Yes, it is. The Signalator autotrader is the trades execution software. This software only automates the process of trades placing in to your account. 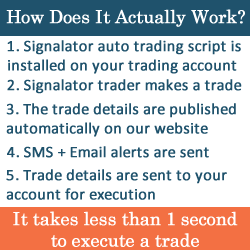 All trades are created by Signalator traders and autotrader simply uses details to put them in your account. Q. What are the benefits of the automated trading? A. The main obvious benefit and the reason to use automated trading is your time. With an automated trading it is not required to spend any of your time on a trading process. All trades will be executed for you at any time. Trades will be executing whatever you do: sleep, work or rest. You won't miss a single trade and your account will be growing. Q. Do I need to have my PC working 24/7? A. The trading platform is required to be running during the trading hours (Monday 5:00 - Friday 20:00) GMT London time. You may use your PC, your VPS or Signalator free VPS. With Signalator VPS server you are offered a 100% automated trading. Q. I don't have a metatrader account, is it still possible to automate my trading? A. Yes, for an additional fee Signalator traders will be executing trades on your account. So you don't do anything at all. Please read more about features of subscription here. Q. Can I use the Signalator autotrader on a demo account? A. Yes, you can use Signalator autotrader with both a real and a demo account. Q. Will I be receiving Email / SMS alerts if I use an automated trading? A. If you would like to receive SMS / Email alerts in addition to your automated trading, there are no problems at all. Signals will be sent to you the way you prefer. Q. What are the side effects of an automated trading, if any? Q. I have an account with Interactive Brokers, is it possible to have trades executed automatically? A. Yes, by using special software available online. All trades can be automatically copied to Interactive Brokers account (for IB Trader Workstation TWS). Service is a subject to additional fee. Please contact us sales for more details. Q. Can you install everything on my side? A. Yes, Signalator managers may connect to your PC, VPS or server to install everything on your side. We may connect directly to your VPS or connect to you PC using special remote desktop software like TeamViewer. Please contact the support team.